The Brinks Hotel, Saigon, following a Vietcong bombing on Dec. 24, 1964. Two American officers were killed. The National Front for the Liberation of South Vietnam (NLF), was a communist army based in South Vietnam that fought against the governments of South Vietnam and the United States during the Vietnam War (1955-75). The group is better known as the Viet Cong (Việt Cộng) or V.C., short for "Vietnamese Communist." American soldiers called the Vietnamese communist forces Charlie, no matter whether North Vietnamese or Vietcong. The group was made up of people from both South and North Vietnam. 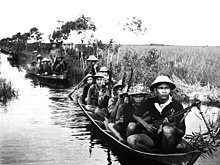 The Vietcong used guerilla warfare, including terrorist bombings, assassinations, and ambushes. The group is best known for the Tet Offense, an assault on many South Vietnamese cities staged in February 1968. The group was closely allied with the government of North Vietnam, which conquered the South in 1975. According to 'Re-thinking Camelot' (Noam Chomsky 1993) the NLF resistance was, in part, the result of terror inflicted upon them by the US backed and guided government of South Vietnam, carried out while the NLF were peacefully awaiting elections promised by the Geneva Accords of 1954. This page was last changed on 9 May 2018, at 03:18.